When lacing your chucks, take the time to straighten out the laces so they are not twisted. They will last a lot longer, look better, and stay more securely tied. When you put a new pair of classic laces on your chucks, be sure to stretch the laces, especially on the bottom pairs of eyelets. Shoelaces tend to shrink a little when they are packaged. After a couple of lacings, the laces will stretch to the exact length you want them to be. 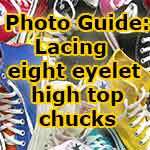 When lacing your chucks, adjust the tongue so that it is centered under both rows of eyelets. Your fit will be a lot more comfortable. The great lacing question: Do you lace with the string starting over or under the bottom set of eyelets? Over/under is the classic lacing style, as seen in the original box photos. Under/over is an alternate style some people prefer. Converse is shipping new pairs of chucks with the shoelaces partially laced using an over/over method. We recommend you relace your chucks using the over/under method, which gives you the classic look and a better lacing fit. Some wearers like the straight across lacing method, often used for advertising purposes (use the link below). This lacing method does not secure the shoe as well as the cross eyelet lacing method. Other wearers like custom and even more original variations on lacing. 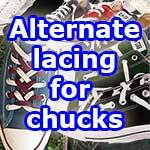 Click on the Alternate Lacing For Chucks link above to see new ways to lace up your chucks. If you have trouble lacing up through the top eyelets, it could be that your laces aren't long enough or you didn't stretch them as you were lacing them the first couple of times. Shoes with seven pairs of eyelets should have 45" long laces, shoes with eight pairs of eyelets should have 54" laces, and shoes with nine pairs of eyelets should have 63" long laces. You should be able to lace them up through all the eyelet pairs and have enough lace left for a small knot with no excess lace. Make sure that the tongue does not have a crease in it when you lace up. 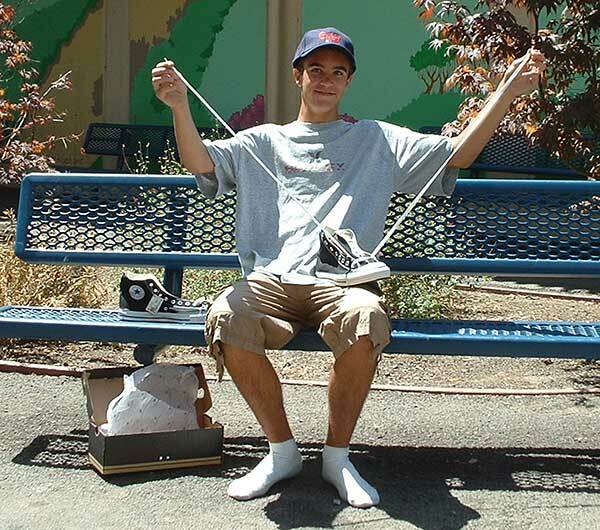 Take the time to straighten out any creases before you lace up. Sometimes older pairs of chucks that have been stored away for a long time will have creases in their tongues. You can easily iron those out with a steam iron. Make sure that the laces on the second eyelet pair are snugged up tight. Often tongue slippage occurs because the lace is loose towards the bottom. 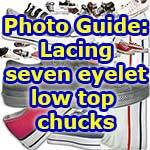 If the above tips still don't solve the problem, and your chucks don't come with notches in their tongues, you might want to consider making two parallel slits in the center of the tongue, about 3/8 of an inch apart and 1/2 inch long, midway between the fifth and sixth eyelet pairs. Mark carefully with a pencil before making any cuts. Place the tongue on a piece of wood or other object you can safely cut on. Use an exacto knife or single-edged razor blade to make the cut. Then when you lace up, insert the lower of the two laces into one slit and out the other. This will help hold the tongue in place. Carol Frey, M.D., an orthopedist at the University of Southern California in Los Angeles, recommends certain lacing techniques that can help you get a better fit. If the heels of your sneakers don't stay in place: When you lace your shoes, make sure that the area closest to the heel (top) is tied tightly; use less tension near the toes. When you have reached the next to last eyelet on each side, thread the lace through the top eyelet, making a small loop. Then, thread the opposite lace through its loop before tying it. If you have wide feet: Use two laces, one shorter than the other. Thread the shorter lace through the eyelets closest to the heel (top), and the longer one through the eyelets closest to the toes (bottom). The top lace should be tied more tightly than the bottom lace. If you have narrow heels and a wide forefoot or narrow feet: Use two laces, one shorter than the other. Thread the shorter lace through the eyelets closest to the toes (bottom), and the longer one through the eyelets closest to the heel (top). Frey suggests that the top lace should be tied more tightly than the bottom lace.